This is the time where Traders in Dalal Street wait eagerly for the Union budget to witness its impact of Stock market Price action. The Government Union budget is one of the most influencing macro events on the stock markets and overall economy of the country.Every major stock has a tendency to show volatility before and after the budget. Greater Policy measures on three major sectors of Indian Economy namely agriculture-related, manufacturing-related and service-related, can have tremendous effect on Stock prices. Union budget and stock market have a strong relation. To understand the effect of Union Budget on Equity markets it is essential to track the policies that government proposes and it’s relation to each sector and major stocks within that sector. This time core fiscal issues such as taxation, expenditures and fiscal deficit can have primary impact on stock market. As a rule of thumb, any sector specific benefits involving lower direct taxes, subsidies, price hikes and reduction can result in massive moves on stock prices, just after the budget. In the present scenario, stock markets are already at an all-time high suggesting that the room for upside is bleak. Nifty and sensex have moved up 30 percent over the last one year without seeing any major dips or retracements. 2018 Budget might surprise market participants very likely with the possible breach of fiscal deficit target and introduction of long-term capital gains tax which could cause Minor selloff and Profit booking liquidation. How 2017 Budget Impacted the Markets? 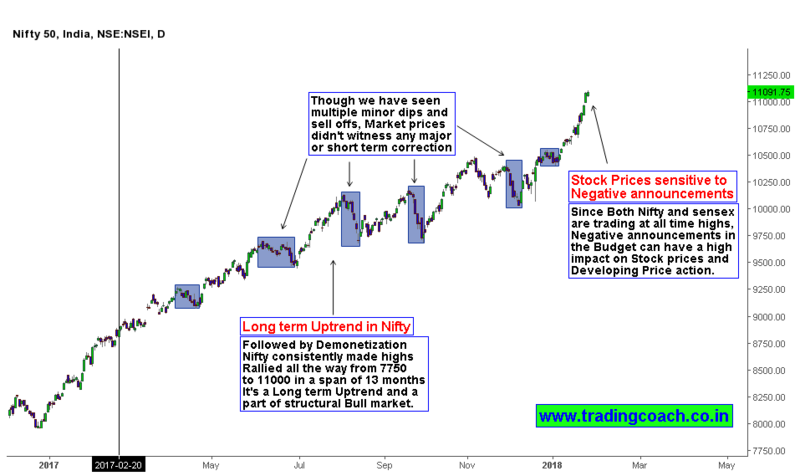 • Stock markets made tremendous moves during union finance minister Arun Jaitley budget speech in 2017.As he was preceding in his speech, Sensex and Nifty rose steadily .It registered one percent gains until he finished. • When Jaitley concluded his speech, the Sensex was more than 300 points up and Nifty was up by 80 points. Both indices gave a euphoric feeling to the Investors. • The Indian rupee also rallied on 2017 Budget day. • The positive movements of both key indices are reflected across the span of markets. It also echoed in small cap and midcap stocks as well. • You will see a lot of dryness in stock prices in the run up to the budget. • Investors and traders must be Patient. First get a better view of the budget and then make your trading decisions, instead of jumping all at once. • Stock market tends to be volatile around the budget. High liquid stocks either rise or fall massively based on the headlines and news. • Many option traders buy put and call options during volatile events. But you will find that options get very expensive during the budget weeks. Since sensex and Nifty is trading at all time highs, negative announcements such as hike in the prices of petrol and diesel, increase in government borrowing and spending etc. can cause more sensitivity in Market prices. The real impact can only be seen after going through the budget proposals completely. Let us keep our fingers crossed and wait and watch, at the same time praying for a better market than last year at least. As usual Track the Price action for good setups and insights. For well-informed traders and Investors budget will offer excellent opportunities regardless of negative or Positive bias during the event! 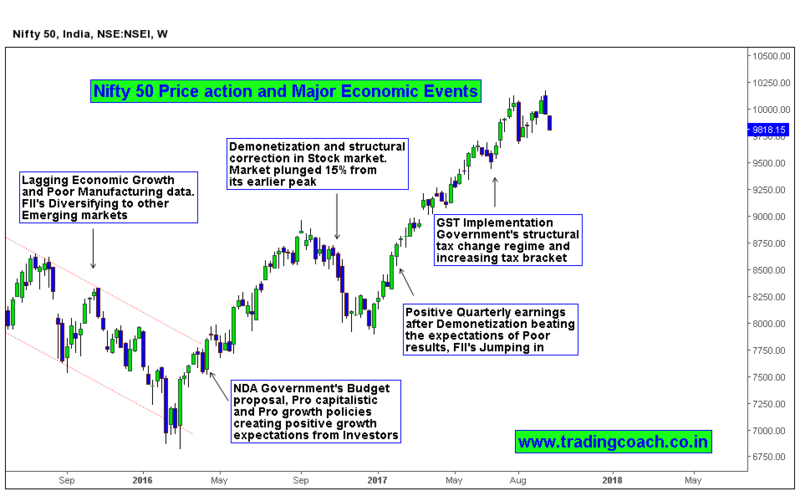 How Government’s Economic Stimulus is going to Impact Stock Market ?